One of the most important relationships that human beings have with plants is changing our consciousness-consider the plants that give us coffee, tea, chocolate, and nicotine. Sacred Bliss challenges traditional attitudes about cannabis by tracing its essential role in the spiritual and curative traditions in Asia, the Middle East, Africa, Europe, and the Americas from prehistory to the present day. In highlighting the continued use of cannabis around the globe, Sacred Bliss offers compelling evidence of cannabis as an entheogen used for thousands of years to evoke peak-experiences, or moments of expanded perception or spiritual awareness. Today, the growing utilization of medical cannabis to alleviate the pain and symptoms of physical illness raises the possibility of using cannabis to treat the mind along with the body. By engaging sacred and secular texts from around the world, Sacred Bliss demonstrates that throughout religious history, cannabis has offered access to increased imagination and creativity, heightened perspective and insight, and deeper levels of thought. this book, humans have been consuming cannabis for various reasons since their earliest days. Far from being recreational, though, cannabis has been used in religions all across history and all around the world to dissolve the boundaries between the self and the divine and open the mind to ecstatic experiences. The author describes cannabis use from every continent and throughout most religions. . . . [I]t's undeniable that worshippers have been using it for centuries. Ferrara urges abandoning marijuana fears and advocates for cannabis' potential as a bringer of 'peak experiences,' which he speculates might lead to a kinder, more peaceful society. * Booklist * Mark S. Ferrara is your affable liberal professor who is not so secretly known to take a puff or two. 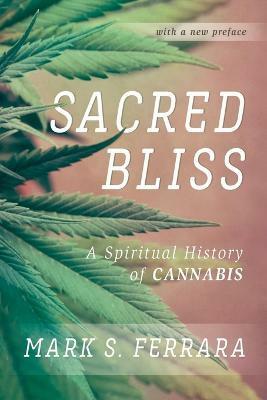 Sacred Bliss: A Spiritual History of Cannabis is a brief but scholarly history of the role of marijuana within spiritual and religious traditions from ancient India to modern Europe. Ferrara's basic thesis is that humanity has for millennia used cannabis as an entheogen, or ritual drug, to stimulate what he calls 'peak experiences'- a term borrowed from psychologist Abraham Maslow that refers to brief moments of sudden spiritual insight, 'an important response to the panhuman yearning for paradise.' [Ferrara's message is] warmhearted and inviting. * Washington Post * Ferrara chronicles the medical and spiritual use of marijuana in different cultures throughout history to demonstrate its curative nature and universal propensity to induce `peak experiences,' moments of heightened awareness. He explores the substance's role in the religious beliefs of Indians, Iranians, Africans, and Native Americans; in the medical practices of the Chinese; and in European and American literary traditions. He also examines how the use and perception of marijuana in these cultures evolved over time, from BCE to the present day. . . .[O]verall, the book provides a cohesive, interesting, and well-supported argument: that numerous diverse cultures have consumed, and might continue to consume, marijuana with the same positive spiritual and medical results. Since Ferrara connects this research to contemporary attitudes about the use and legality of marijuana in the US, the audience for this book will extend beyond religion to those interested in topical political issues. Mark Ferrara is associate professor of English at SUNY Oneonta. He is the author of several books, including Palace of Ashes: China and the Decline of American Higher Education.